These are really cool! The Finnish post office (the link above) lets you order on-line AND they will ship overseas! 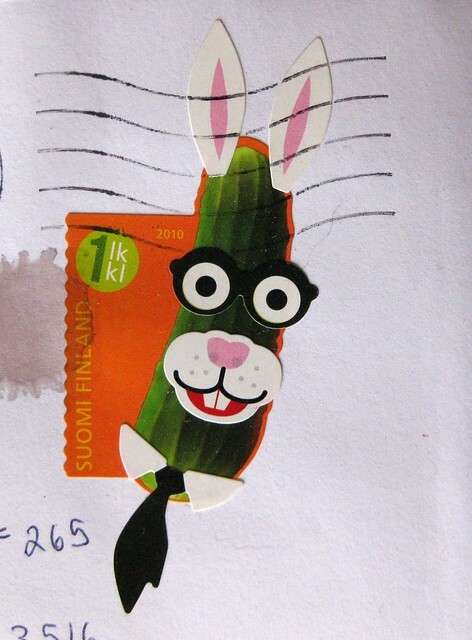 €6 (6 €1 stamps + a sheet with a generous assortment of eyes, noses, etc ...). I want! Though my wide says she'll get me a Mr. PotatoHead instead. I have never seen interactive postage before! That is so nifty! That is very cool! Our post office should take some ideas from Finland. Oh, this is fun to see! The Royal Mail produced a similar series about 7 years ago and I couldn't get enough of them, they decorated everything that went out! I'm in love with Finland, too. Cool stamps, cool design aesthetic in general. And they are such amazing PostCrossers! These stamps are soo sweet. Thanks for posting about them. Very cool! I've never seen that before. Tsar Nicholas II postcard... and stamp?